Do you mind having spectators when you’re playing games? To kick off today’s weekend thread, I talked to Will Feinstein. He’s a video fellow for The Onion who also helps out on A.V. Club and Gameological videos—including recent episodes of The Digest. Will captured some of the game footage for The Digest last month, and I decided to ask him about that this week, because I’ve always found it to be a strange experience. Most video games don’t presume a spectator—aside from the player’s hybrid participant-spectator role—and I find that my play changes significantly when I know somebody’s watching (or is going to watch). Sometimes I like having a spectator, as it lends an extra import to the events on screen, and sometimes I can’t stand it, because I know that the game I’m playing is tedious to watch. How does having another person in the room affect your play? Share your thoughts and, as always, your weekend gaming plans in the comments. 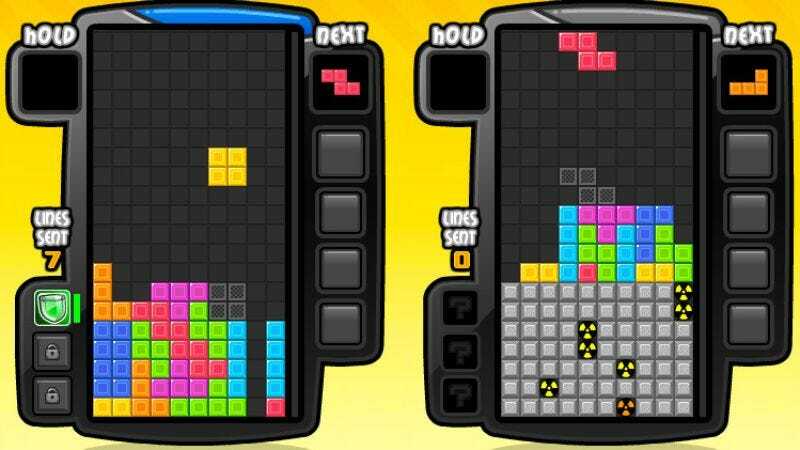 Will Feinstein: This weekend, I’m playing Tetris Battle, which is the official competitive Tetris app on Facebook. You can play against your Facebook friends, but mostly you’re matched up head-to-head with other random users. JT: How does the battle work? WF: There are a bunch of modes, but the one I prefer is a two-player version where you send junk lines to your opponent when you do well yourself. The idea is to knock out the other player by clearing lines very quickly. I can never tell if I’m playing a real person in real time, but I like to think I am. JT: What do you mean? Is it sometimes a computer? WF: It tells you it’s a person, but the other person stops playing when you pause and only starts playing when you hit play. It’s very suspicious. [It appears that Tetris Battle uses pre-recorded game sessions, although the inner workings aren’t entirely clear. —ed.] I also really hate every app and every game Facebook pushes on me. Except this one. JT: Are you a longtime Tetris player? WF: I am. I like to think I’m better than most people I encounter. Battle is fairly well designed, except it asks you to pay or watch ads if you use up your plays for a certain amount of time. Which is the worst, but also stops me from spending too long on there. That is a real danger. JT: That’s interesting. Maybe the paywalls are healthy in that respect. WF: It feels almost benevolent. WF: And I’ll never cross that line! JT: You recently started doing some game footage capture for The Digest. What is it like to play a game when you know people are going to be watching what you do. When I’m getting footage, I find I use the camera differently—less twitchy and more cinematic, or aspiring to be cinematic. You didn’t play anything with camera controls for the last Digest, but still. Did it feel any different, or did you just barrel ahead? WF: I did consciously try to do interesting things in the game play that would make good footage. For example—this somehow didn’t get recorded—I spent a long time during Octodad in a bathroom stall in the game. My goal was to show that being stuck in a toilet was a metaphor for how much fun the game was. Or wasn’t. JT: So you came at it with a filmmaker’s eye. WF: I attempted to. But that particular game was so frustrating that I eventually did just try to get through it. I did worry that it would look like I was just bad at the game and couldn’t control this octopus. There was some pressure there. JT: Yes. I’ve also run into that problem where, even if I’m pretty capable at a game, there’s a difference between being good at a game and having the footage look like you’re good at it. Like, I’m a freaking mess when I play Grand Theft Auto V, but I’m a functional, effective mess. Still, when I did the footage capture for it, I tried to be somewhat less shambolic. Does it bother you when someone’s watching you play a video game? Not for a video, but just someone else on the couch. WF: Not during Tetris because I’m probably doing something impressive. But during anything else, I fear someone will take the controller away from me so they can do the hard thing. JT: I know that fear well. Nobody wants to be usurped. You need the freedom to screw up. WF: Especially since I don’t play very often. If I’m at a friend’s house playing and they let me play for a second, I feel like it’s a privilege that I’m going to lose when I let them down. I definitely had that experience with Grand Theft Auto V.
JT: You’re playing not just to win, but for the very privilege of continuing to play. Tense! WF: I always think it’s a weird scenario when everyone’s on the couch and one person is playing a video game. There’s always going to be a little contention there. One person is going to be having more fun than everyone else.